Sometimes no matter how hard you think you’re exercising, you always see people working harder. On the flip side, you constantly hear “no pain, no gain”, but when is it too much? When is training hard, too hard? Firstly, you need to look at your goals and what you’re expecting from your exercise programme. If you’re exercising for health, you don’t need to work as hard as someone training for competitive sport – training intensity is individually set, so you can work hard within your own parameters. If you’re going to put the time into exercising, you want to make sure you reap the maximum benefit. 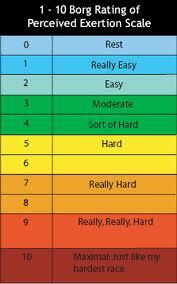 Low intensity activity (taking the dog for a walk, walking to the shop etc) should measure 4-6 on the RPE scale, meaning your heart rate would increase but not to the point where you are breathing heavily. Moderate intensity activity should feel like you are working, but not so hard that you need to stop after a few minutes – you should be breathing hard, but not gasping for breath. On the RPE scale, this would be at about 6-7. High intensity cannot be sustained for more than a couple of minutes, as you are working at about 8-9. You will be breathing deeply, sometimes gasping for air. As this is such a high intensity, it lends itself well to interval training. Working at a high intensity needs adequate recovery, so make sure the session after is low to moderate intensity to prevent over training. This is a very individual way of rating your workouts, meaning that you get the most out of each session without comparing yourself to everyone else.